Anyone else here spends hours on Pinterest pinning recipes that you never actually make? We've all been there, in fact it's such a phenomenon that most bloggers like myself have a board for recipes we've actually made from Pinterest. 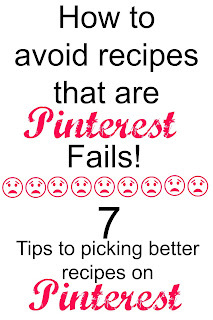 Trying recipes on Pinterest of course leads to Pinterest fails. We've all been there. The picture looks amazing and you get hungry just looking at it. But then you make the meal and it either went horribly wrong or it was just OK and you'll never make it again. I've had many over the years and I've learned from my mistakes. I'm much better at looking at recipes and knowing if it will be a hit or miss with my family. 1. Does the picture match the ingredients? I was burned bad by a recipe that looked so good. It was a spicy sausage pasta so how could it possibly go wrong? Well it went way wrong. Beyond wrong! So bad that no one would eat it. Just the smell alone made me want to toss the meal without trying it. I went back and realized that the pasta the blogger claimed to be using in the pasta was different from the picture. There were other ingredients missing as well. Obviously she used a picture from another recipe, which was confirmed for me about a year later when I found the original recipe. Next time you see a picture that looks amazing check out the ingredients. Do they match up? If not chance are you're not actually looking at a photo from that blogger. This is done often in copycat recipes, they photograph the real meal and then give their take on the recipe. I never trust those recipes, if you have a true copycat recipe on your hands you would photograph what you made not the restaurant. 2. Does the recipe match your taste buds? I cannot tell you how many times I've clicked on a recipe and then saw the ingredients and knew I wouldn't like it. Great food photographers can make almost any dish look amazing. You'll never love a recipe if you don't like the ingredients. I know it sounds like a no brainer but it isn't. For example I am not a fan of condensed soup, cream cheese, or sour cream. I can eat one of these if they are not the star of a dish. One of the three is OK but two are more is a no go. I cannot tell you how many recipes I see that use all three, casseroles and Crock Pot recipes being the biggest offenders. I know I will hate this meal no matter how great the picture looks. Skip any recipe that has ingredients you don't love. 3. Can you modify the ingredients? I just said you shouldn't make anything if you don't love the ingredients. Can you modify the ingredients to your taste? I saw a soup recipe that used ground chicken which I thought was really strange. I made it using chicken thighs that I shredded and it was amazing. A simple swap but without the swap I'm confident we wouldn't have liked it. When it comes to vegetables and fruits I look at recipes the same way. A pasta salad with olives? Nope my kids and husband won't eat olives so I swap them out for something else like red bell peppers. Why people like a crunchy topping on a pasta is beyond me. Adding sliced almonds on a pasta or bread crumbs on mac and cheese just ruins it for me. Just my personal preference that's all. When I see an ingredient that I don't like I just leave it out. I'm known for eliminating or drastically reducing the amount of vinegar in asian cooking. I don't like vinegar but I understand that it severs a purpose in the dish. I just cut it down or omit it all together if the recipe calls for a small amount. Some blogs don't generate tons of comments. Most readers are mobile these and don't take the time to comment. However you want to see if anyone has made the recipe and came back and commented on the post or the pin. Ignore comments like "looks good." Of course it looks good that's why you click on it in the first place, you want real feedback. Plus when people modify recipes they will often leave how they modified it in the comments. You'll also see questions on how to make it too which is helpful when a recipe is vague. 6. Follow food bloggers you love. When I find a few recipes from the same blogger that I love I check out their other recipes and follow their boards on Pinterest. You already know you like their cooking style and that their recipes work which is 99% of the battle. During the week I'm all about fast and easy meals. I don't have the time or the patience to cook for more than 45 minutes and even that is a stretch most night. I'm more of a 30 minute meal kind of mom during the week. I also know I'm never going to want to cook a recipe that has 45 ingredients or uses every pot and pan in the house. So know your limits. If you can't make a roux or if makes you sweat just thinking about it, then making gumbo from scratch might not be a good choice for you. If you know you don't have the time to reduce a sauce by half and that you'll end of skipping that step which changes the recipe completely that is not the recipe for you. It's all about knowing your limits and choosing wisely. 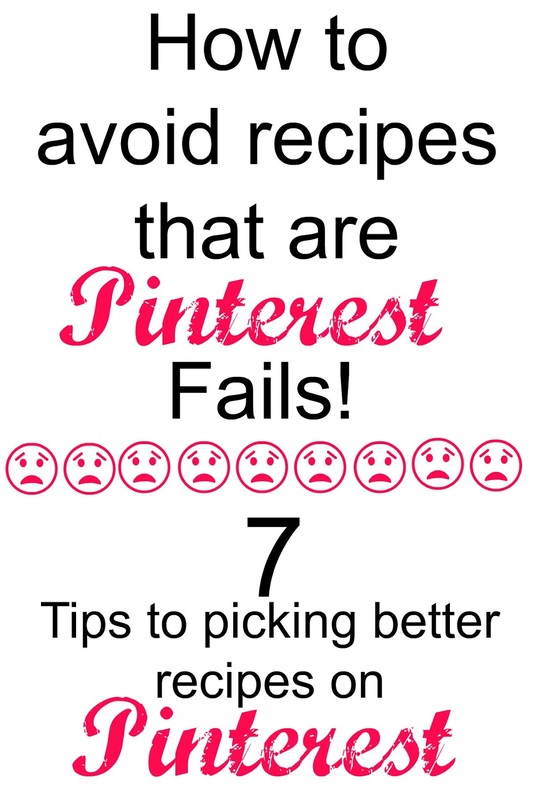 I'd love to tell you that if you follow these 7 tips you'll never have a Pinterest fail again. But we all know that will never happen. These 7 ideas will help you pick recipes that are more to your taste which ups the odds that you'll like it. Do you have any tips when it comes to picking recipes on Pinterest? Thanks for stopping by. I was so mad when I realized that the picture didn't even have the right type of pasta. How did I miss such an easy warning sign?